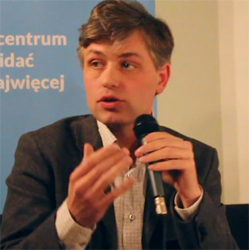 Jarosław Kuisz is the editor-in-chief of Kultura Liberalna, an assistant professor at the University of Warsaw’s Faculty of Law and Administration and an associate researcher at Paris’ National Centre for Scientific Research’s Institute for History of the Present-Day. Jarosław also lectures at the University of Warsaw’s Interdisciplinary College of Individual Humanist Studies and College of the Liberal Arts and a recipient of Polityka‘s prized national scholarship award for young Polish academics. In 2014, he was a visiting scholar at the University of Chicago and a visiting fellow at Vienna’s Institute for Human Sciences. Information valid as of spring 2015.